TRENTON –Attorney General Christopher S. Porrino announced that five additional individuals have been charged criminally with filing fraudulent applications for federal relief funds related to Superstorm Sandy. Since March 2014, the Attorney General’s Office has filed criminal charges against 76 people for allegedly engaging in this type of fraud, including the five individuals charged on Thursday November 10th. The Attorney General’s Office is continuing its aggressive efforts to investigate fraud in Sandy relief programs, working jointly with the New Jersey Department of Community Affairs (DCA), and the Offices of Inspector General of the U.S. Department of Homeland Security, the U.S. Department of Housing and Urban Development (HUD), the U.S. Small Business Administration (SBA), and the U.S. Department of Health and Human Services (HHS). Also assisting the taskforce is the New Jersey Division of Consumer Affairs, the New Jersey Motor Vehicle Commission, New Jersey Office of the State Comptroller, and the non-profit National Insurance Crime Bureau (NICB). The individuals who have been charged are alleged, in most cases, to have filed fraudulent applications for relief funds offered by the Federal Emergency Management Agency (FEMA). In many cases, they also applied for funds from a Sandy relief program funded by HUD, low-interest disaster loans from the SBA, or funds provided by HHS. The HUD funds are administered in New Jersey by the New Jersey Department of Community Affairs and the HHS funds are administered by the New Jersey Department of Human Services. Stephen Hewitt, 64, and his wife, Sharon Hewitt, 60, of Westville, N.J., allegedly filed fraudulent applications following Superstorm Sandy for FEMA assistance and state grants under the Homeowner Resettlement Program (RSP), the Reconstruction, Rehabilitation, Elevation and Mitigation (RREM) Program, and the Sandy Homeowner and Renter Assistance Program (SHRAP). As a result, they received approximately $52,146 in relief funds. The Hewitts allegedly falsely claimed in their applications that a home they own on Mohawk Drive in Little Egg Harbor, N.J., which was damaged by Superstorm Sandy, was their primary residence at the time Sandy struck. It is alleged that, in fact, their primary residence was in Westville, and the Little Egg Harbor home was a summer/vacation home. As a result of the alleged fraudulent applications, the Hewitts received $28,216 from FEMA, a $10,000 RSP grant, and SHRAP funds totaling approximately $13,930. Their RREM application was denied. 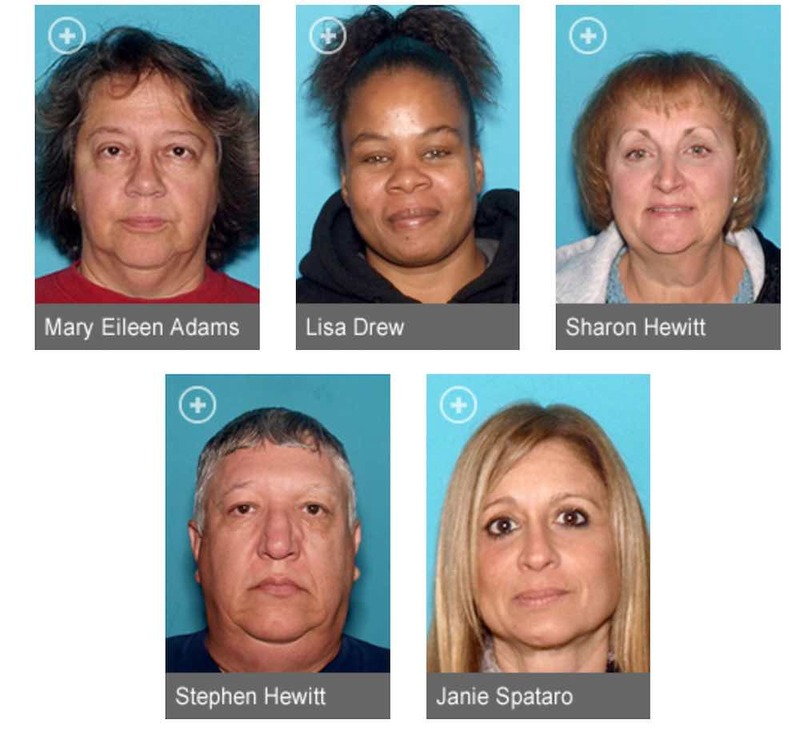 The Hewitts are charged with third-degree theft by deception and fourth-degree unsworn falsification. Mary Eileen Adams, 63, of Glenmoore, Pa., allegedly filed fraudulent applications following Superstorm Sandy for FEMA assistance and state grants under the Homeowner Resettlement Program (RSP) and the Reconstruction, Rehabilitation, Elevation and Mitigation (RREM) Program. As a result, she received approximately $31,949 in relief funds. Adams allegedly falsely claimed in her applications that a home she owns on Atlantic Avenue in Beach Haven, Long Beach Township, N.J., which was damaged by Superstorm Sandy, was her primary residence when Sandy struck. In fact, her primary residence at the time allegedly was in Pennsylvania, and the property in Beach Haven was a rental/vacation property. As a result of the alleged fraudulent applications, she received $5,090 in FEMA rental assistance, a $10,000 RSP grant, and $16,859 in RREM monies. Adams was initially awarded just under $75,000 in RREM grant funds, but additional funds were denied after a check for $16,859 was issued to her because it subsequently was determined that the Beach Haven home was not her primary residence at the time of the storm. Adams is charged with second-degree attempted theft by deception, third-degree theft by deception and fourth-degree unsworn falsification. Janie Spataro, 52, of Beachwood, N.J., allegedly filed fraudulent applications following Superstorm Sandy for FEMA assistance and state grants under the Homeowner Resettlement Program (RSP) and the Reconstruction, Rehabilitation, Elevation and Mitigation (RREM) Program. As a result, she received approximately $21,711 in relief funds. Spataro allegedly falsely claimed in her applications that a home she owns on East Long Branch Avenue in Ocean Gate, N.J., which was damaged by Superstorm Sandy, was her primary residence when Sandy struck. In fact, it is alleged that the property in Ocean Gate was a vacation/rental property. As a result of the alleged fraudulent applications, she received $11,711 in FEMA rental and home repair assistance, and a $10,000 RSP grant. Her application for an RREM grant was denied. Spataro is charged with third-degree theft by deception and fourth-degree unsworn falsification. Lisa Drew, 45, of Camden, N.J., allegedly fraudulently obtained a total of $9,479 in FEMA rental assistance by filing false applications following Superstorm Sandy. Drew allegedly fraudulently claimed that she was forced to evacuate an apartment in Camden due to storm damage, and subsequently entered into a month-to-month agreement to rent a room from her daughter at an apartment complex in Blackwood, N.J. In applying for FEMA rental assistance, Drew submitted a lease for the Camden apartment and rental receipts for the room in Blackwood. Those documents allegedly were fraudulent. It is alleged that Drew did not live in either the apartment in Camden or the apartment complex in Blackwood, as claimed. Drew allegedly received four payments from FEMA for rental assistance totaling $9,479. She is charged with third-degree theft by deception and fourth-degree unsworn falsification. The new cases were investigated by detectives of the New Jersey Division of Criminal Justice, Investigators of the NJ Office of the State Comptroller, and special agents of the U.S. Department of Homeland Security Office of Inspector General, HUD Office of Inspector General, (and) SBA Office of Inspector General and HHS Office of Inspector General. Deputy Attorneys General Norma R. Evans, William N. Conlow, Valerie A. Noto and Denise Grugan are prosecuting the new defendants under the supervision of Deputy Attorney General Michael A. Monahan, Chief of the Financial & Computer Crimes Bureau, and Deputy Attorney General Mark Kurzawa, Deputy Bureau Chief. They are working with Lt. David Nolan, Sgt. Fred Weidman and Analyst Alison Callery, who are conducting and coordinating the investigations for the Division of Criminal Justice, along with others, including Special Civil Investigators Rita Binn and Jeff Gross, and Investigator John Silver of the NJ Office of the State Comptroller. For Hewitts: Stephen Guice, Esq., Stephen Guice, PC, Barrington, N.J.